Discuss strategies to improve history education in our schools with people coming at it from different perspectives on Tuesday, July 7 at 12 noon (Eastern) in a Google Hangout co-hosted by the National Assessment Governing Board and the American Historical Association. 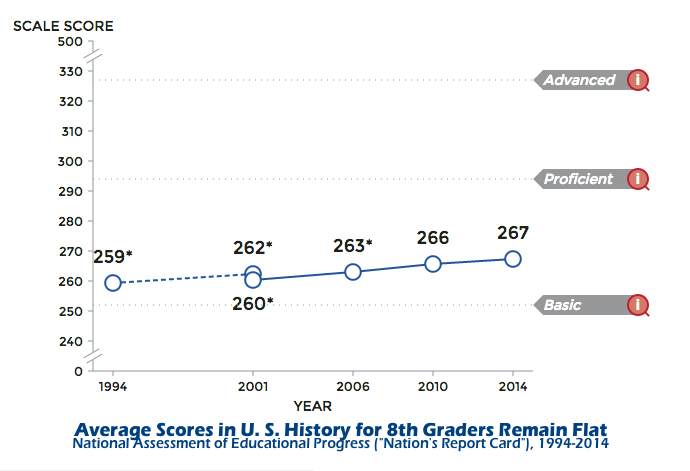 It’s in response to the latest results of the Nation’s Report Card, which shows that many students lack a strong understanding of our nation’s history (as seen in the chart, scores have been flat for the past twenty years, and the conversation will explore ways that students can become more engaged and informed. Hmm, can historic sites and house museums play a role? and the conversation will be moderated by Jessica Brown, contributing writer at Education Week. To register or for more information, visit Why History Matters at the National Assessment Governing Board. This entry was posted in Community engagement, Historical interpretation, Interview, Leaders in the field and tagged American Historical Association, Google Hangout, Jim Grossman, Judith Gradwohl, Libby O'Connell, Nation's Report Card, National Assessment Governing Board, National Assessment of Educational Progress on June 25, 2015 by Max van Balgooy.